Check out my other property (2 beds / 2 baths) at Mesquite Country Club with direct views of the golf course in South Palm Springs at Vrbo #1264054. Or my other listing at Desert Skies Vrbo # 775200 (unit 101). Resort Living - Without The resort Fees!! There is always something going on in Palm Springs! Whether it is Coachella Music Festival, Stagecoach Country Music, American Documentary Film Festival, Palm Springs International ShortFest, Mid-Century Week, Indian Wells Arts Festival, Village Fest, Greater Palm Springs Restaurant Week, LPGA ANA Inspiration Championship, and so much more! 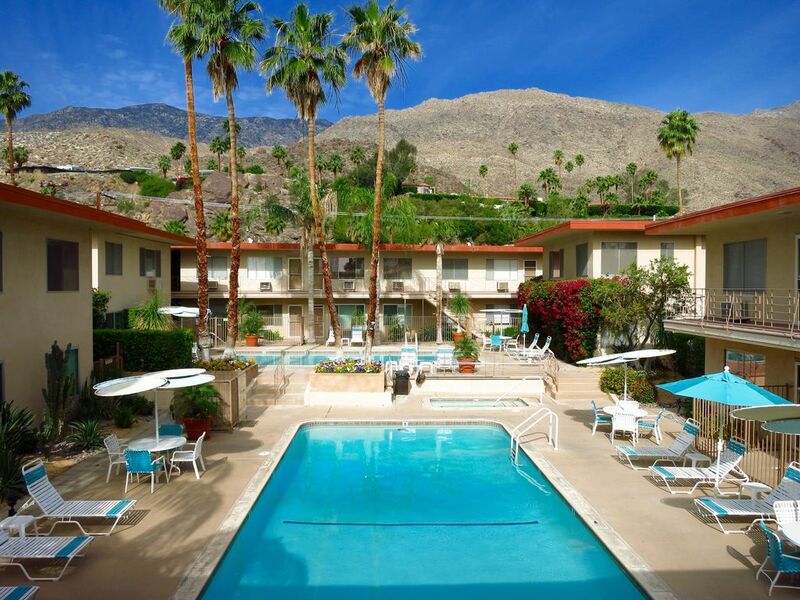 CONDO RENTAL UNIT AT DESERT SKIES LOCATED ON THE QUIET SIDE OF THE COMPLEX, AWAY FROM THE BUSY STREET NOISE OF SOUTH PALM CANYON DRIVE. This upper unit condo has great views of the two pools and spa, and spectacular mountain views while located away from busy South Palm Canyon road (less noise). Many tenants over the years have said the views from the unit are "the best views in the complex." * Mountain Views (Have been told the views from the unit are "the best views in the complex." SORRY, NO PETS, NO SMOKING IN UNIT. (All funds must be drawn on a US bank in US funds.) Any foreign currency exchange fees, or other fees are to be paid by tenant. I decided to purchase in Desert Skies once I saw how beautiful, and well maintained the grounds are. The mid-century architecture really interests me as well. I really like how peaceful, and quiet it is here. The unit is away from the street, so there is minimal street noise, and offers beutiful views of the mountains from every window, along with pool and spa views. Stunning views Quiet location of unit Soundproofing walls between units Beautifully landscaped and well maintained grounds 2 pools and 1 spa (1 heated) Gas BBQ grill 2 Rec rooms On-Site Laundry Nearby Hiking, Golfing, shopping, banks, restaurants, cafes, etc. Beautiful views of Mt. San Jacinto from living room and bedroom. Past tenants said the views are the best in the complex with the way the unit is situated. All linens including bedding, bath towels, and pool towels provided. Two laundry rooms for a total of 4 washers. Two front loading. Two laundry rooms for a total of 4 dryers. Various DVD's available for your enjoyment. Ceiling fans and ACs in living room and bedroom. Excellent Accommodation! I stayed for 3 months . This was an absolutely fantastic place to say. Tom was a gracious and helpful host. The pools were pristine and the neighbors were friendly and helpful. The location had easy access to everywhere in Palm Springs. I cannot say enough good things about this unit. I would strongly recommend it to anyone. Thank you so much for your kind review and words. I don't often have the opportunity to meet my guests, and someone as lovely as you. Thank you for staying at our place and the best of luck to you and your new place! Sixth time staying at Desert Skies and always enjoying the atmosphere and easy access to heated pool (84F) and hot tub so possible to swim every day no matter the weather. When weather turned cold the heater was very efficient and easy to operate. Unit is comfortable and TV has good channel choices. Internet connection good but had to log in daily. While there is a password for guest it doesn't appear to be a secured connection. We appreciated the telephone service. A car is essential for basic grocery shopping and there is excellent parking provided, new tiling finish underway. Bed was really comfortable with good lighting for reading. Lots of storage space for luggage and clothing in walk in closet and extra drawers. Kitchen even has a dishwasher, just the right size, lack of counter space can be a bit frustrating. There are many pans and dishes to provide whatever style you enjoy. Having a desk with basic essentials was very good. I would highly recommend staying here. We are happy to hear you had a nice time again in palm Springs. Thank you for being returning guests to Desert Skies for many years. Sorry to hear about the wifi - had you mentioned it to me I would have been able to help you log into a secured account. I didn't realize the password required to log in was disabled. As mentioned, I will let you know if I have a cancellation for next season. I will also inform you if I have something in Sandstones, as I am planning on buying a unit there (April 2017) for seasonal rental. I was fortunate to be able to come back to Palm Springs and stay at Tom and Brian’s unit at Desert Skies. I had stayed in the lower unit in December 2015, but it was booked in 2016. Fortunately for me, there was a last minute cancellation with their upper unit. I immediately booked for the month. The upper unit was very nice with the mountain views, and was furnished very comfortably with the oversized sofa and CalKing bed. The kitchen was fully stocked for those wishing to cook at home. There was also a BBQ that I enjoyed a few times. Tom was great again with communication from start to finish. I had asked him to hold my security deposit for December 2017, but he mentioned it had been reserved in October 2016! I can see why people are booking more than one year in advance!!! It was great to see you again. The hike was fun. I spent 3 month this year living at Tom and Brian's place and I'm not sure i can say enough nice things. The views are stunning, the neighborhood and complex itself are incredibly safe, quiet, peaceful. And Palm Springs is one of my new favorite places- EVER. Tom is a fantastic host, who is really committed to offering a great place, and great service to his renters. A truly lovely person who is both totally available, and completely respectful. The unit itself was (literally) spotless, stocked with everything you need even for a long term stay, with really nice quality furnishings, quality pots and pans, super fast WIFI, a great TV- a real home away from home. The property and grounds are extremely well maintained. The pools were always lovely and clean, the laundry facilities were spotless, the neighbors are quiet and friendly. I absolutely loved it here and will cross my fingers I need to return again!! HIKERS- this is paradise:) Indian Canyons are a 20 minute stroll from the apartment!! FELLOW LADY TRAVELERS- if you're traveling on your own, this spot is perfection. Safe, quiet, and super comfortable. I lived in the complex for 3 months and highly, highly HIGHLY recommend. This one is exactly as awesome, and beautiful as it looks in the pictures. Don't hesitate to rent if you're in the area. Thank you so much for the wonderful review. That was very nice and sweet of you. So many people read and rely on reviews, so its nice to see when a tenant takes the time to sit down and write one as nice as yours. Looking forward to seeing you again someday. All the best to you in the year! WHAT A GREAT PLACE THIS IS - BOTH THE UNIT AND THE COMPLEX!!! The grounds are beautiful with the desert landscape, fruit trees, and mountain views. The unit was spotless and had everything needed and more. I can understand why there are so many great reviews. Tom was great from the moment I contacted him, to receiving my security deposit refund after my stay. We stayed in August, and yes it was HOT! (We were remodeling our home and was in need of somewhere comfortable and safe to stay.) Fortunately, the unit had great working ACs and being close to the mountain, the sun would disappear a lot earlier than it would in the rest of the valley. It really helped to cool down and was a great time to enjoy the 2 outdoor pools, or even a nice walk or hike. Not far is a large supermarket, great restaurants, gyms, a yoga/pilates studio, banks, dry cleaners, etc. The highlights were the comfy big bed, fully stocked kitchen, the games, books, and DVDs to enjoy, and the quiet of the complex. Everyone here was very friendly and wouldn't hesitate to answer any questions we might have had about the area, where to dine, and what to see. CLOSE TO EVERYTHING, AND THE BEST PART IS ITS CLOSE TO THE MOUNTAIN, SO AT 5:00 PM YOU START GETTING SHADE, WHILE THE REST OF THE VALLEY IS IN DIRECT SUN, YOU GET TO ENJOY THE EVENING A FEW HOURS EARLY ! AS FOR THE UNIT, CUTE, WELL FURNISHED, KITCHEN HAS EVERYTHING YOU NEED, SO YOU DON'T HAVE TO EAT OUT ALL THE TIME. ONLY DOWNSIDE TO KITCHEN IS COFFEE POT HAD NO SETTING TO MAKE STRONG COFFEE! EVERYTHING ELSE GOOD, ALSO A BBQ BY THE 2ND POOL, MADE IT NICE SO YOU DIDN'T HAVE TO COOK IN THE CONDO ! ALSO, A BIG PLUS FOR ME, IT WAS A MATURE CROWD, NO SCREAMING KIDS IN THE POOL ! NEIGHBORS ALL VERY FRIENDLY ! A POOL WHERE YOU CAN TRULY RELAX ! Norm, thank you for your kind review and thanks for leaving the place so clean and in great shape. Let me know if you would ever like to come back...and remember I have 2 places to choose from. Located in the sought after area of South Palm Springs with less wind than the north end and close to golfing, restaurants, and hiking trails (across the street). There are many banks, restaurants, coffee shops, and supermarkets (Jensen's, Ralph's, Vons) near by. Also, Sunrise Park has tennis and an olympic size swimming pool, along with the Public Library. Enjoy free entry at the Museum and/or the downtown street fair on Thursday nights. Booking deposit transfers into a Security deposit upon arrival. Full deposit is mailed within 21 days of vacating (must provide forwarding address), PROVIDING there is no damage, missing or broken items, extra charges, etc. and as outlined in the Lease. If extra cleaning is needed beyond what is customary, the fee may come out of the deposit. Tenant pays anything in excess of $125 per month for electric. (Gas, water and hot water unlimited) NO Smoking (including e-cigarettes, etc.) NO pets of any kind.